Place a sponge soaked with water in a plastic plate and allow child to sprinkle it with birdseeds. Place the plate in a sunny place and watch for the seeds to sprout! The seeds will continue to sprout as long as the child keeps water in the plate. they are visible from the outside. Cover the cup with plastic wrap, and tape a second cup on top of the first. Observe the seeds for a while. Once they start to grow you may want to transport them to potting soil. Make a greenhouse out of 2-liter pop bottles. Ask each child to bring one to school. Just cut them in half with a utility knife beforehand and peel off the label. Make slits going long ways so the top section will fit over the bottom section. Have them fill it with dirt and plant bean seeds, flowers seeds, grass, or whatever you have. Put the top section back on. Put them in a sunny spot. The great thing is you only have to water them about once or twice a week. The items really grow great and it gets really warm inside of the pop bottle!! Put pumpkin or lima bean seeds in a wet paper towel and put it all in a clear zip lock baggie. This is just one fun idea if you have room for 26 plants. Let your youngster choose from asters to zinnias, and make signs for each plant. Begin by taking a cardboard milk carton and cutting out a flap on one side, cut three sides so it can be opened like a door. Tape a piece of plastic wrap over the window on the inside. Fill the carton with soil and plant a couple of seeds (pumpkin works well). Place the side opposite the window up on a block so the carton is at and angle. When the plant begins to grow, the roots will grow towards the window, allowing you to open the window and see the roots. Be sure to keep the window closed when not viewing. Directions: Get small boxes, line them with plastic, and fill them with potting soil. Have your children scratch out their name in the soil. Have them sprinkle grass seeds into the name. 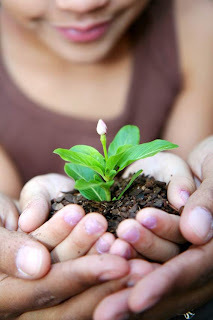 Gently cover it with soil and soon you will have their name growing in a garden. Each child will wet his pine cone in the bowl of water. Fill a jar with water and set the pine cone in the top of the jar. About 1/4 of the pine cone needs to fit snugly in the jar and reach the water. Sprinkle the pine cone generously with grass seed. Place the jars in a windowsill. Help the children add water to their jars when needed. Be careful not to wash the seeds away. Grass will sprout in a few days. To root a sweet potato in water, push toothpicks halfway into the potato. Then place the potato in a glass of water with the toothpicks resting on the top rim. Make sure the end of the potato is immersed in water. Place the glass where it will receive adequate light. Maintain the water level so that the bottom of the potato is always immersed. Note that in a few weeks roots will grow out of the sides and bottom of the potato, and leaves will grow out of the top. The plant can be left in the water or replanted in soil. This activity provides the children an opportunity to observe root growth. The next time you have carrots for dinner, save the tops. Carrot tops are easy to grow and produce nice foliage. Fill the pie plate with a layer of pebbles about one inch deep. Cut off the tops of several carrots. Fat, short carrots work the best. Put the carrot tops on the pebbles, cut side down. Add enough water to cover the bottoms of the vegetables. The carrots should not be completely covered with water. Use the pebbles to prop up your carrot tops and to keep them arranged the way you want. Place the pie plate out of direct sunlight. Check the water level daily. If your carrots begin to shrivel, there is not enough water in the pie plate and they will not sprout. Sprouts should appear in about a week and there will be new growth every day. The carrots will continue to sprout for about a month. Beets, radishes and turnips also can be grown this way. Sprout several root vegetables at the same time to make a nice arrangement.